Publishing a project or package means here: create a copy of the project/package directory and sub directories. Note: It does not copy files outside the project/package directory. Developers are welcome to improve this. Command after - After copying all files, run this command. For example compressing the directory into a tgz archive. Ignore binaries - do not copy binary files. Use include filter - enable this filter. All files matching the filter will be copied. Otherwise all files will be copied. Simple syntax - don't use IDE regular expressions in filter field. Use exclude filter - enable this filter. All files matching this filter will not be copied. Otherwise all files will be copied. Simple syntax - don't use IDE regular expressions in filter. Save info of closed editor files - store information of all files to the .lpi, that were once opened in the editor. 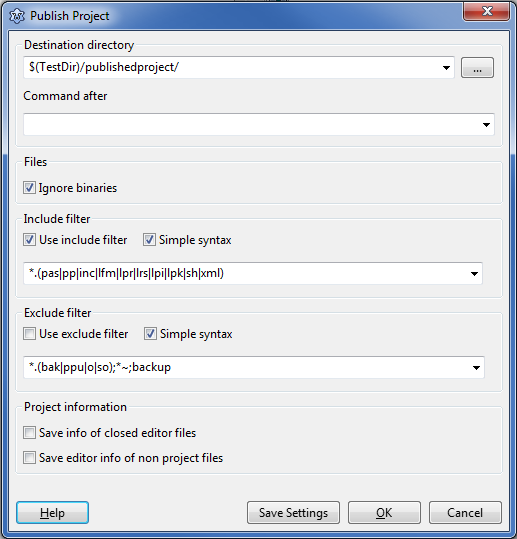 Save editor info of non project files - store information of all files to the .lpi, even those, that are not part of the project. This page was last modified on 26 May 2017, at 13:29.